Last Saturday I photographed the start of the march from Lincoln’s Inn Fields to the rally in Trafalgar Square, part of the international day of action to mark the 40th anniversary of the Middle East War (aka 6 Day War) under the slogan: “The World Says No to Israeli Occupation“. The unfortunate truth is that much of the world has generally failed to say no, or at best has only whispered it, while America keeps shovelling support to Israel. At the very start, during the war, it was Russia that failed the Arabs (and in particular the Palestinians), their failure to respond scuppering any effective UN action. I’ve considerable sympathy and support for Israel, but not in this respect. As kids we thrilled to the story of David and Goliath, the small boy taking on the powerful giant with his sling and smooth stones and winning. Thousands of years later, many here welcomed the new state of Israel, and certainly we acknowledge its right to a peaceful existence. But now the bulldozers and tanks are driven by Israeli soldiers and the small Palestinian boys throw the stones with generally negligible effect. Of course there are attacks on Israel, particularly by suicide bombers and the largely random firing of rockets. Israel publicy blames the Palestinian government while knowing that it has destroyed any ability they might have to prevent such things happening, and uses this impotent failure as an excuse for disproportionate retaliation. The current near civil war could not have happened without years of this misguided Israeli policy of undermining successive Palestinian governments in every way they can – when obviously making a peace settlement needed a strong Palestinian leadership. Recently I’ve been reading the reports of a friend in occupied Palestine as a human rights observer. Deacon Dave is now back here and was on this march. His reports tell of the everyday and almost incessant harassment of Palestinians by the army. Dave himself was attacked, fortunately only receiving relatively minor injuries, and he ducked just in time as he saw a soldier about to open fire. Later, there were apologies from some officers, but it was very much a case of too little, too late. As well as the army, there were also regular attacks on Palestinians and observers by settlers, but he also told of the efforts by Israeli groups such as ‘Rabbis for Human Rights’ to stop the arbitrary demolitions of houses. Wars, though sometimes justified, seldom if ever solve problems; usually they simply prolong them. In the end there has to be the difficult process of learning to live together, peace and reconciliation, something that has been put off far too long in the Middle East, perhaps largely because it simply is something that few Americans appear to realise as a possibility let alone a necessity. Last month I heard Arwa Abu Haikal, a long unpaid government employee of the Ministry of Youth and Sports in Hebron talk movingly about life under the occupation, and in particular the problems of living near settlers, who though often settling and acting illegally are seldom bothered by the Israeli Army. 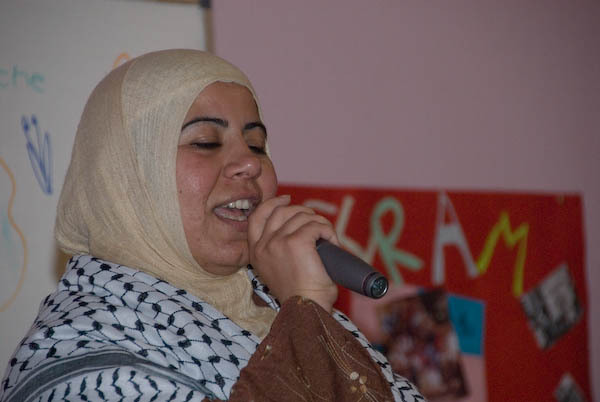 The picture shows her later that day, singing a lullaby from Palestine. I was pleased to hear that the NUJ in April had called for support for a consumer boycott of Israeli goods. It didn’t surprise me when some members suggested it called into question the impartiality of our reporting of the issues and others made allegations of anti-semitism, although I don’t beleive either comment is justified. Although it has caused considerable outcry, and there are some problems with the way the issue was handled at the ADM, I hope that it will be confirmed at next year’s meeting. The Palestinian people need and deserve our support – as too do the Israeli people, but not their current government policies. Of course the eventual settlement in the area must enable the two peoples to live together. This entry was posted on Thursday, June 14th, 2007 at 05:52 pm and is filed under My Own Work, Political Issues. You can follow any responses to this entry through the RSS 2.0 feed. You can leave a response, or trackback from your own site.